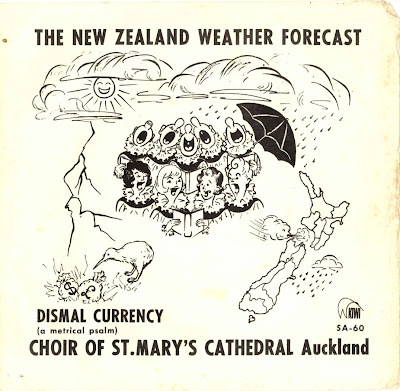 The inspiration for this episode was a crazy record I picked up recently in Wellington - The New Zealand Weather Forecast as sung by The St Mary's Cathedral Choir. That reminded me of a more famous weather forecast song, 'Outlook For Thursday' from Dave Dobbyn's band DD Smash. To be honest I'm not a great fan of that song but there is an interesting cover version of it recorded by Dark Tower, the Christchurch kiwiana hip-hop outfit fronted by Jody Lloyd, who went on to form Trillion. There are lots of songs written about the weather of course. And because this is New Zealand most of them are about rain. As former Prime Minister Geoff Palmer once said, "New Zealand is an indubitably pluvial country". So there's no shortage of depressing grey odes to drizzle such as 'Rain' which closes A Maze and Amazement, the 2007 album from Counting The Beat favourites The Enright House. The track is a beautiful instrumental perfectly suited to a grey wet day. To mix things up a bit I've also included a sunny song from Cool Rainbows, 'Southern Summer Sun'. the song has been out since February but I haven't picked up on it til now. As you'd expect it's a wistful gentle poppy song remembering a summer love affair. Cool Rainbows are headed up by Djeisan Suskov (pictured), who used to be part of Trees Climbing Trees, who played a farewell gig to about 6 people (including me) on Waiheke back in January this year. I've posted a Cool Rainbows clip on the video page. When it comes to weather, there's something about a good storm. They also seem to lend themselves well to music. I once lived on a cliff top looking right into the prevailing wind. The perfect music for a stormy night was The Renderers album I Dream of the Sea but is I was back there now another album I might choose on a windy night would be Circa Scaria by An Emerald City. Their epic instrumentals blend rock with the exotic eastern sounds of lute and sitar and they have the grandeur of a storm -they sound like they could fill the sky and sweep you away. The podcast features the closing cut from Circa Scaria 'As The Storm Comes In'. There are An Emerald City clips on the video page and you can hear a live session recorded by National Radio (stream).